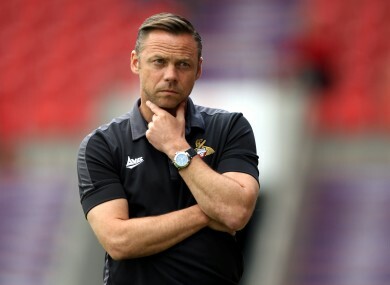 Doncaster Rovers Manager Paul Dickov was praised for his side's actions. DONCASTER ROVERS ALLOWED Bury to walk in an equalising goal unopposed in their English third-tier match on Saturday after they had unintentionally taken the lead themselves. An attempt by Doncaster’s Harry Forrester to pass the ball back to Bury following a throw-in in stoppage time ended in a freak goal when it bounced over visiting keeper Christian Walton, who had originally kicked the ball into touch following an injury. But with time ticking away at the end of the match, Doncaster manager Paul Dickov told his players to allow Leon Clarke to stroll half the length of the pitch unchallenged from the kick-off and score the equaliser, which meant the match finished 1-1. “I didn’t really think twice about allowing them to equalise. It just wouldn’t have been right for us to take three points in the circumstances,” said Dickov. Bury manager David Flitcroft hailed his opposite number. “I’ve got the ultimate respect for Paul Dickov. He tried to get the referee to award a foul throw initially but then he’s allowed us to score from the restart. Email “Walk this way! League One team allowed to score unopposed goal”. Feedback on “Walk this way! League One team allowed to score unopposed goal”.